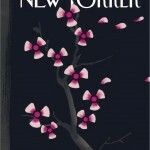 ☛ The New Yorker: “Dark Spring” cover by Christoph Niemann, March 28th, 2011. © Condé Nast, 2011. See the cover on Christoph Niemann official website.